↑ 1.0 1.1 McClure, H. Elliott (1991). Forshaw, Joseph, संपा. 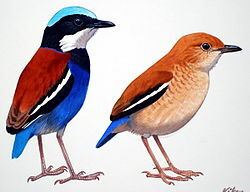 Encyclopaedia of Animals: Birds. London: Merehurst Press. पप. 159–160. ISBN 1-85391-186-0. ↑ BirdLife International (2008). "Gurney's Pitta Pitta gurneyi". IUCN Red List. IUCN. पहुँचतिथी 7 मई 2009. ↑ BirdLife International (2008). "Pittidae". Data Zone. पहुँचतिथी 7 मई 2009.